That quote from Bills General Manager Brandon Beane should be music to the ears of every fan who has spent the last few months as a draft expert. The Bills top decision-maker knows what the team needs. Actually, he knows what every team needs. Beane made that comment at Monday’s Bills Pre-Draft media gathering. But while you may want to automatically assume that it means the Bills will definitely do whatever is needed to get a QB, you need to consider another Beane quote. This came after he was asked if the draft will be a success if the Bills DON’T get a franchise quarterback. In two quotes, Beane said exactly the opposite thing and did nothing to make any media member or fan think they know what the team is going to do. Remember, that’s exactly what Beane wanted to do. Did you think he was going to stand up there and tell you their plans? Or tell you what you wanted to hear? He knows the entire league will see these quotes. He can’t tip his hand. Beane’s said all along that the team needs to get a franchise quarterback. I believe they will. I believe that’s why every move they’ve made…going back to last year’s Draft trade with Kansas City… has been made with a franchise quarterback in mind. The need is obvious. But just because there’s a need doesn’t mean there’s a solution. That’s the mystery, intrigue and drama surrounding what the Bills will do in the first round. 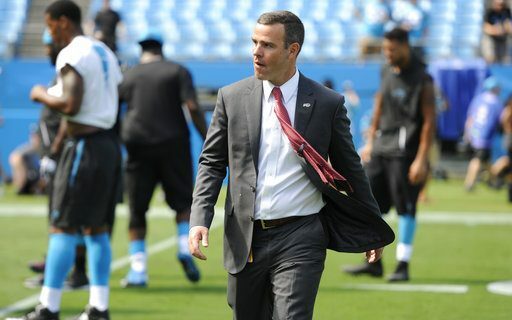 I believe they will make every effort to go get the quarterback they have determined to be the best fit. That may be one, two or all of the Big 4 QB’s. But what is the price going to be to get one? Yes, the Bills have more assets to deal than any other team. But that doesn’t mean you give them all away. There’s always a proper price. Just like when you buy a new car. They all have a value. Just because the Bills need one (or are desperate for one) doesn’t mean you agree to anything. That’s why next Thursday’s first round will be so much fun. Who will Cleveland take? What will the Giants do? Which QB do the Jets love? Not knowing any of that means the Bills will have to be ready for all scenarios, and react to what happens. Beane says that is already happening. Beane may not be, but I will be disappointed if the Bills don’t get a franchise quarterback next week. They will never have this much ammunition to move up It makes no sense to have it if you don’t use it to get the one position that generally comes from high in the draft, and the one position you flat-out don’t have. What if the Bills want to, or need to, get into the top five to get their guy? It would be realistic to think that they’ll be asked for next year’s #1 pick. Do they do it? Is it worth it? If it’s for a guy you believe in, why not? But again, there has to be a value. Maybe that depends on which guy. “I don’t know what quarterback will be there, I don’t know if we’re going up, going down. That’s really how it is as I sit there. I know everybody assumes we’re trading up. First of all, I said it before, even if I wanted to trade up right now, even if I said ‘I know the guy I want to get, and I need to get to this spot’, it takes a partner to do it and be willing to move out,” said Beane. I don’t want them to trade next year’s #1. But I’m fine if they do it.